5150 Grandview Blvd. Dacono CO. 80514 Family Owned and Operated Since 1946. 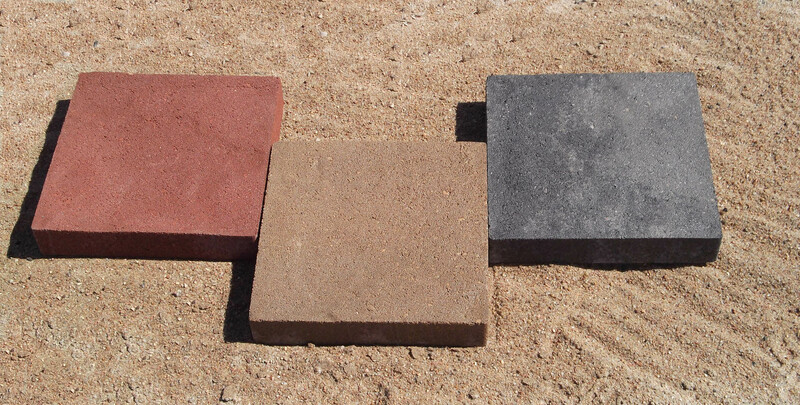 Patio block are different than pavers in that they are thinner and have a larger surface area. The pathway in the photo above is made with brick patterened squares and provides a width for easy access from the garage and driveway to the back yard without losing the effect of the cobblestone accent. Unlike pavers, they are unable to support the weight of vehicle traffic. Their job is to make beautiful patios and walkways. As shown in the above photo, using patio stones is a very attractive way to reduce the amount of grass or vegetation, which requires water and maintenance. 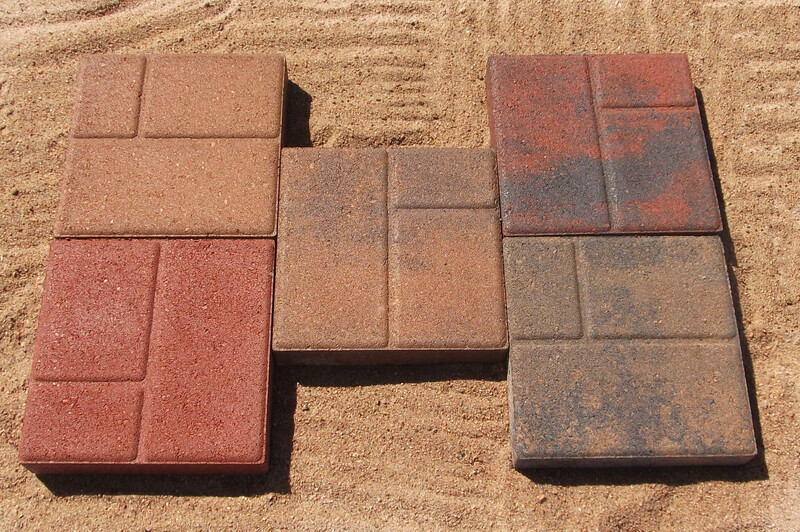 There are a variety of patterns that can be created by carefully choosing compimentary colors and vivid contrasting colors of paving stones. Let us assist you in preparing the perfect patio pattern for your custom look. This elegant patio is created using a plain color accent border around multi-colored pavers that coordinate with the walkway and the wall. It creates a private setting in a wide open area. We manufacture many different styles of patio stones. No matter what your style is, you are sure to find a patio stone that would look great around your house. The above photo features our Exposed Aggregate patio stones used in the patio and our Holland Pavers are used in the walkway. The Holland Pavers can be used as an accent border, a pathway or even as the entire patio surface. They are versatile and colorful. The Exposed Aggregate comes in several different sizes and shapes. This provides another opportunity to be creative with your project, especially when there is one feature area within your project that you would like to stand out with a different texture. The Exposed Aggregate block product is manufactured with a larger aggregate and the top of the block is washed off to expose this aggregate. This natural look is gaining in popularity every season. Patio stones require a compacted and level base and sand prior to installation. For your convenience, St. Vrain Block has provided patio installation instructions for the "Do-It-Yourselfer" to use as a guide. There are always tips and tricks available from our expert staff available. And we're only a phone call away: 303.833.4144. We have a large selection of patio stones including squares, rectangles, slabs, rounds, hexagonals and exposed aggregate. Our squares, rectangles and rounds come in the greatest variety of sizes and colors available anywhere. If it's edging you need, we have a couple of options from the traditional garden border to lawn edgers. With a little creativity there are several ways to edge a yard with some of the products we have in our other categories. Use the free Adobe Reader to view and print the St. Vrain Block PDF brochure. shape size (w" x h" x l") lbs./ea #/pallet #/sq. ft.
shape size (w" x h") lbs./ea #/pallet #/sq. ft.
shape size (w" dia x h") lbs./ea #/pallet #/sq. ft.
measured flat side to flat side lbs./ea #/pallet #/sq. ft. Please contact us with any special order requests or questions. Use the free Adobe Reader to view and print the PDF files. Below are some of the most commonly requested documents, brochures and information. Let us know if you have a special request! We are continually updating our brochures, listed below. So contact us or check back often to see the latest! Each project has unique characteristics or challenges. Using your measurements, we will provide an estimate of product quantity necessary for your project. Call us at 303-833-4144 or contact us online with your request. We can recommend various Landscape Professionals or, if you are the 'Do-It-Yourself' type, we provide these helpful installation instructions. Every industry has quirky terms that can be confusing especially if the product names sound alike, but are actually not comparable at all in quality or intended use. Contact us if you have any questions. The ASTM International Standards Certifications awarded to St. Vrain Block are held in very high regard. Quality has been the foundation of our reputation since 1946. Please review our ASTM Certifications page for more information.